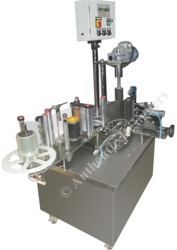 Providing you the best range of Labeling Machines such as Automatic Round Bottle Labeling Machines, Automatic Flat Bottle Labeling Machines (Two Head Labeling), Automatic Top Labeling Machines, Hologram Labeling Machine for Continuous Roll, Automatic Sticker & Hologram Labeling Machines for Sheets and Automatic Tube Labeling Machines with effective & timely delivery. 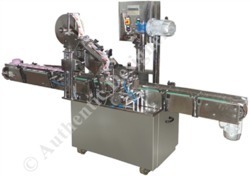 With our proficiency in this relevant domain, we are able to provide an optimum quality assortment of Automatic Round Bottle Labeling Machines in the national market. cosmetic bottles, cosmetic containers ,shyrup bottles, souce bottles, beer bottles, flavour milk glass bottles. 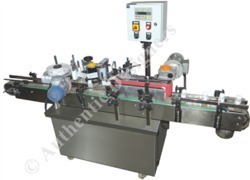 By keeping track with the market development, we are offering optimum quality Automatic Flat Bottle Labeling Machines. Microprocessor based state of art technology with continuous duty operation Automatic registration of labels through label sensor. Sensing adjustable to accommodate a variety of color schemes of labels. Option for attaching inkjet printing. 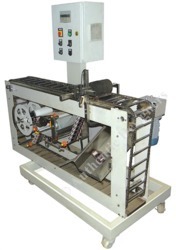 The machine can be attached with any other packing machine or operation to give online application. With sincere intentions to uplift our reputation in the market, we bring a distinguished assortment of Sticker Labeling Machines. Provided labeling machines are manufactured using optimum quality components and innovative technology in compliance with industry norms. 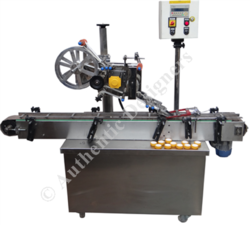 Our offered labeling machines are available in different sizes and designs so as to fulfill the needs of our customers. Power 0.5 kW, 230 Volt, 1 Phase, 50 Hz. AC. Label size 100 x 200 mm max. Speed Up to 60 Dispensing per min. 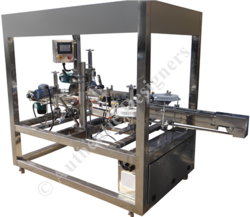 With a precise understanding of the relevant industry, we introduce ourselves as the leading manufacturer, exporter and supplier of Tube Labeling Machines that are used for plastic and aluminum tubes. The offered labeling machines are manufactured by our skilled professionals using the latest technology and premium quality components in adherence with industry norms. 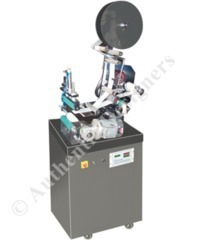 Rendering optimum performance, these labeling machines are available in varied designs and sizes. 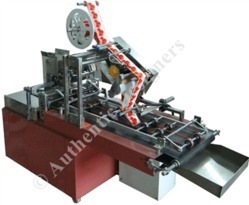 Top Labeling Machine, manufactured by our company, are carefully engineered from optimum grade raw materials as per industrial requirement and fulfilled with large number of striking quality features that make them highly praised and demanded in the markets. Books, Note book, Paper sheets, jar, bottle, Carton etc. We are successfully offering a quality approved Pouch Labeling Machine to our clients. In line with set industry standards. cosmetic bottles, cosmetic containers ,syrup bottles, source bottles, beer bottles, flavour milk glass bottles, Ayurvedic Bottle etc. other labeling Machine. cosmetic bottles, cosmetic containers ,syrup bottles, souce bottles, beer bottles, flavour milk glass bottles. Under the strict supervision of our experienced professionals, we are offering an innovative collection of Automatic Labeling Machines. The offered labeling machines are manufactured by using superior quality components and cutting edge technology in sync with industry norms. Our provided labeling machines are thoroughly checked by our quality experts for ensuring their efficiency. 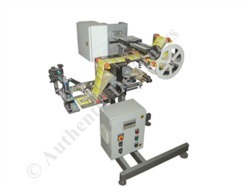 In line with customers’ varied needs, we offer these labeling machines in different sizes and specifications. Pouches, boxes, jewel boxes, bottle, jar, metal components, stationary, can etc. We are leading manufacturer of Front and back labeling machines and we looking buyer of Front and Back Labeling Machines from all over the world. Application: Bottle , carton, jar, Card etc. Feature: This is front and back Labeling machine. it is use for label past on the product. Packing Material: Self adhesive sticker. Speed 40-50 labels per min. Digital display for setting of parameters. All machine covering of stainless steel. Applicable to one circle labeling and front and back labeling of cylinder bottles for daily chemicals, beverages, pharmaceuticals industries etc. This machine Used for Books, note Bokks, Mono carton, Box etc. 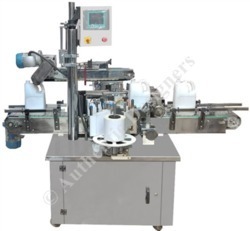 other product packing machine. (Variable frequency drive make Siemens / Delta) Label Sensor: Datalogic Germany / Leuze- 2 nos. Power 3.5 Kw, Single Phase. In case of transparent label: special sensor will be required.